You know what happens when you actually sit down to read a magazine uninterrupted for two hours - you end up wanting a lot more things than you anticipated! Since we flew American this past weekend, I didn't have any TV to occupy my time like I usually do on Jetblue flights so that means I actually read through - cover to cover - two magazines! The result - a lot of items that are on my radar right now! With Pinterest and literally everything online I hardly ever actually earmark things in magazines - forget about actually tearing something out - well that changed and now I have a wishlist for Fall & Winter! So the first item is actually not something I saw in a magazine, but actually on People.com...which has a magazine so I'm not cheating! It's this Remi & Reid reversible tote. The last thing I need is another tote, but for this price tag and 10% off I can justify it! But if I need to justify it, it's actually buying 3 bags in one because 1 & 2 it's reversible so you have two different tote options and 3 it comes with a mini pouch inside that can be converted into a cross body so it's the perfect travel bag as well! I saw Leandra Medine who is the founder of Man Repellar, sporting this Fossil watch and immediately felt drawn to it. I think the rose gold color along with the gray leather band is a great combination and I'm all about it! Then I dug deeper into the watch collection and liked the navy watch as well - so clearly a decision has to be made! I also didn't realize that Fossil had such a great line of watches...I know living under a rock over here! I love the look of silk blouses, but adding a tie to it sort of takes it up a notch for me. I can't decide between this plaid one from Ann Taylor or this beautiful blush one. I feel like with the blush one I'd wear it all the time because it would go with more, but the plaid is sort of fun and different for the corporate world! Moroccan Oil Dry Shampoo// I have yet to find a dry shampoo that I have liked enough to repurchase - I know that everyone swears by Batiste, but sadly it didn't work for me. I feel like there is now hope with the dray shampoo for dark tones from Moroccan Oil. Sally Hansen 18K Gold Cuticle Eraser// I actually already picked this up because I find that when I get a manicure at a salon the reason the nail polish stays on longer is that they actually do my cuticles! I haven't been able to try it yet, but the packaging has me very hopeful! Maybelline Brow Drama Pro Palette// I really only fill my brows when I remember too...which isn't that often, but the reason I don't normally like to do it is because I feel like they look caked on. After I saw the pretty ad in the magazine I went to YouTube and saw this review and was pretty sold on getting the palette. What's on your Fall/Winter wishlist? I am a sucker for a good silk blouse. They are so beautiful and feminine and can make you feel fabulous. I like reading magazine when I need a break from my tablet or laptop. Sometimes the written word is better than the online. Oh man, now I have a lot on my radar too, lol. Thee are amazing selections, the tie blouses are amazing this year, that tote, oh my! The watches, the...., well, got some things to add to husbands Christmas list for me. Ha ha! Happy day beautiful!! Ohhhhh I want to try that Sally Hansen cuticle eraser. I am not skillful at all with a cuticle tool so that would be a total life saver! i love that watch. i go through a phase every fall where i want a new one! I feel like that blush one would be AMAZING on you and would really pop!!! Just my two cents!! 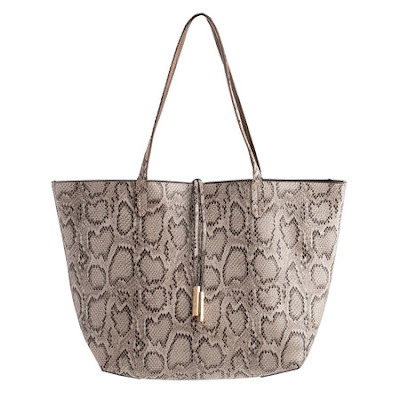 That snakeskin tote is not normally something I would be drawn to, but I love it!! Love all your picks! I use a tinted brow get and I like it so so so much more than any pencil or powder I've ever tired. It's really easy to apply and doesn't give you that chalky look! I haven't read a magazine in WAY too long! I'm a big fan of Ann Taylor for work- simple, but fun and for me the for is great! Glad you got some you time on the flight! Have you tried the Klorane dry shampoo? It works so well! That serum sounds awesome. Definitely picking that up to try! I love Fossil watches and that grey one is gorgeous! I also really need that reversible tote now that you've put it on my radar, haha. Great picks, lovely! It's been forever since I've actually read a magazine too! I'm petty much obsessed with anything rose gold right now, so I love those watches! Both of those blouses are pretty, but I think that I like the blush one better. It just looks a little more feminine. I have to admit that I couldn't recommend a dry shampoo (some hairstylist I am!) because I just use baby powder! Perks of blonde hair, ha! I used to use that Boots serum back in the dayyyyy and really liked it, then just moved on to other products (because I have a major beauty problem, lol)- I wanna give it another shot now that they've reformulated it! I have been meaning to try that serum, so thank you for the extra push! I LOVE that bag and the price! Such an amazing find!! Love those watches! I had basically forgotten about Fossil watches once I discovered MK watches. Magazine reading is the besssttt! Love those watches lady! So cute! Fossil watches have come a lonnngggg way - love both of those! 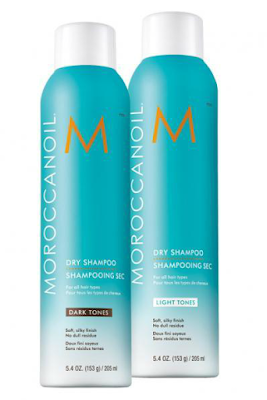 And definitely try the Moroccan Oil dry shampoo, it's awesome! I really do love being able to sit down and read a good magazine. Last year I had a subscription to Shape and I LOVED it!!!!! I really do need to get a cute watch! I'm going through my magazines now. So far a new crockpot is on my list. Boring, right? Ohh I hope you try that dry shampoo so you can report back! haha I do love Batiste, but the scent is so strong that lately I haven't felt like using it as much. Really intrigued by that cuticle eraser too! Oh that tote is fab!! You know me, I love a good tote bag! I have that Boots serum and LOVE it. It works really well. I love those bow blouses! The pink one is now on my must-buy list! I enjoy the uninterrupted time on flights to read magazines (I only really find the time on flights), books or other peaceful things! I’m completely loving the tie blouse style this season! Great round up! Loving that snake skin bag! I LOVE magazines and subscribe to about a million of them!! I have been wanting to try that dry shampoo too ... hoping it smells better than some of the ones I've tried that smell too chemically! Love that Fossil watch. Flying is always my magazine time too. I need to check out that dry shampoo too. Ha ha! I know what you mean. I have so many subscriptions and get so excited when I receive them in the mail, but then I rarely get a chance to read them cover to cover! Love all your picks especially that plaid tie bow blouse. That would be perfect for the holidays! I have that navy watch and absolutely LOVE it! The gray is gorgeous, too. I might have to add that one to my collection! I love a good tie blouse...I feel like they are so classic. I recently read a magazine for the first time in a while. It was a really nice change of pace from looking at the computer screen, but it definitely can be just as dangerous for the wallet! I've been eyeing this Ann Taylor plaid print in dress form! It's so perfect for fall! Yes! I love that serum, I use it every day! 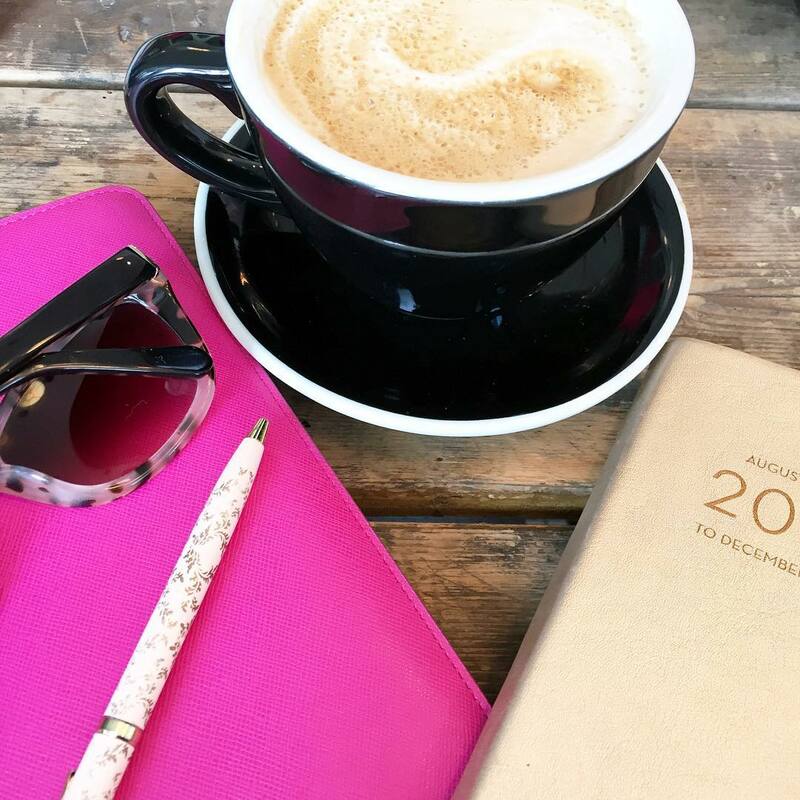 Love your list and I love that tote! I've wanted to start doing my cuticles too. They always look so good when I get them done and terrible when I do my own :-p Love that tote too! 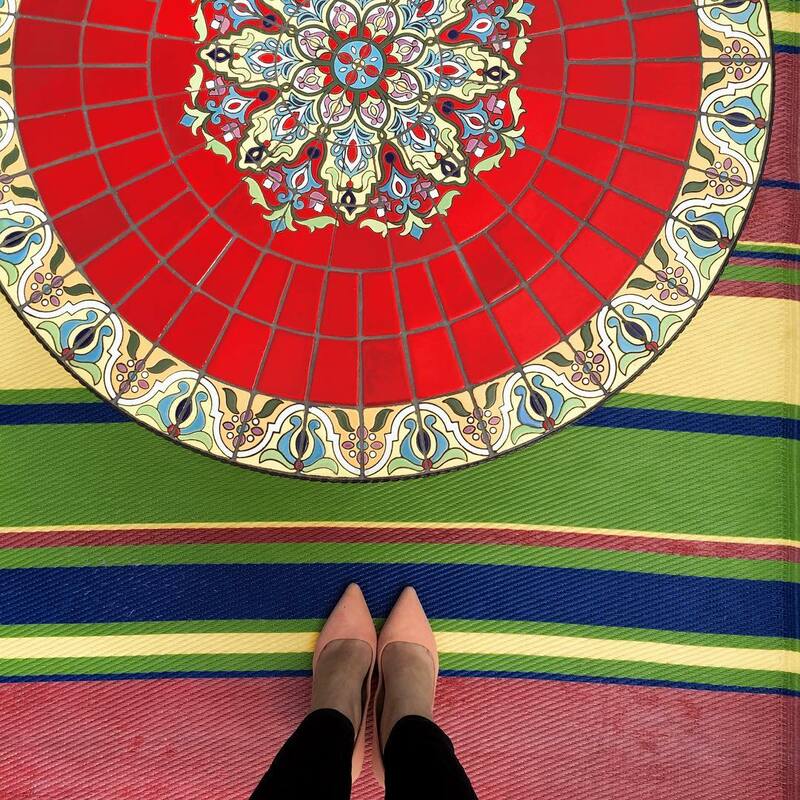 I love Moroccan Oil products! My favorite dry shampoo is by Oribe. The cuticle eraser is very intriguing! I'm going to try it. 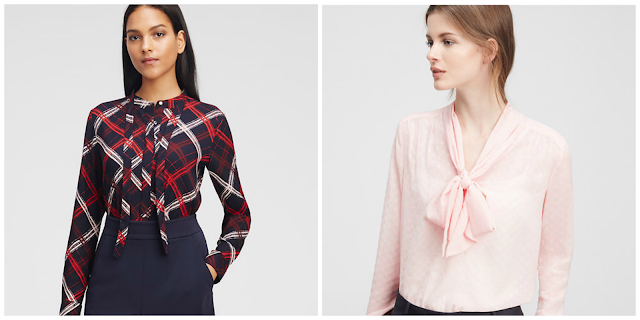 I love the plaid blouse, but the pink one would get you through more seasons! I love reading magazines on planes! That Boots No 7 was on the news last night about how good it is for the cheaper price. That bag is stunning! I love me a good tote! I am a huge fan of all things Boots. They have some killer products! I love those Fossil watches for fall. Great picks Bianar, you have great taste! I love my Fossil watch, when I got mine you could swatch faces and bands. I have the Brow kit but I think i need to watch the video. Oh, I know how that goes... My fish list always grows after I have time to flip through some magazines :) Nice selection, by the way. I'm still on the hunt for some brown fringe booties... I just can't seem to find the perfect pair, and when I do, they don't have my size. Sad face. I want that watch!!!! It's beautiful! The cuticle eraser really intrigues me! I will have to look that up. Don't you hate when that happens?! Dang magazines! Omg in love with those fossil watches! So cute! I need to try that dry shampoo too! I totally want to try that cuticle eraser! And those shirts are gorgeous! 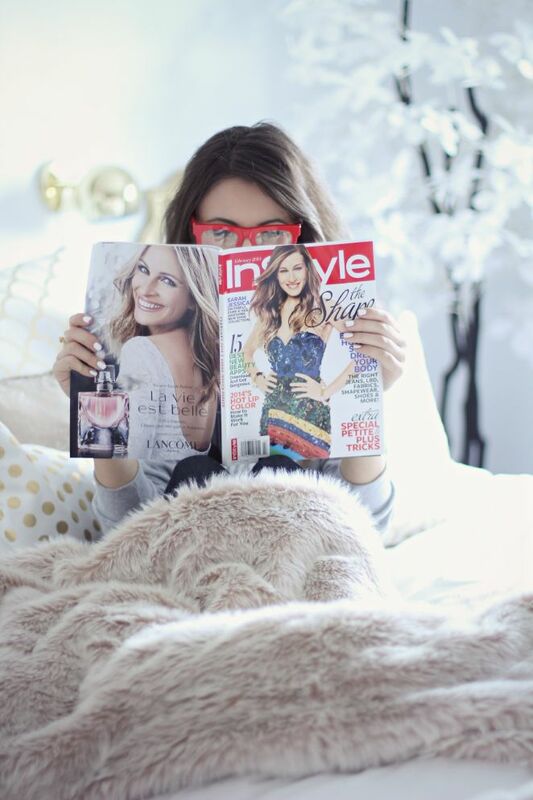 I used to buy piles of magazines every month, but Pinterest has really slowed that down... but there is still nothing as relaxing to me than flipping through an good ol' magazine!! I have a stack of magazines just waiting to be read. The sept issue of vogue still hasn't been cracked yet, ugh so behind! Such fun picks, loving the reversible tote! I have a stack of Southern Living just waiting for me to have an hour to attack it! Soon. Sometime soon. Although that doesn't make me want to buy stuff... It makes me want to make my home beautiful, so I feel like it's worth it! I am loving how cute that tote is - the pattern is perfect with the simple shape. I also think I need that cuticle eraser. Ive never heard of it but mynails could use all the help! I've been looking to try a serum. The seems like a good option that doesn't break the bank! The snake skin patterned purse is so pretty! I love that style! That purse needs to be in my closet! Well anything animal print does, but I love that! The next item I'm ready to check off my must have list is the blanket scarf and the herringbone vest! I have that problem as well. Whenever I'm in no spending mode I try to make sure that I stay away from magazines and online shopping sites. I want to try that serum!! love looking at magazines! I love that handbag! 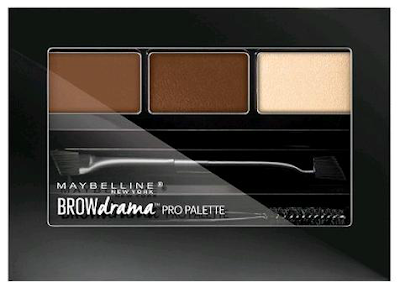 The Maybelline Brow Drama is a product I've been looking at for a while! These are all great picks, thanks for sharing! I'm loving that python tote!! My TB tote has taken a beating in PA school and I need to get a new one soon... maybe Christmas?! Love those tops! If only I had places to wear them these days. It takes me so long to read magazines these days. But flights are wear it's at. I get so much reading done on flights. I almost bought that Fossil watch recently, and I'm still thinking that I may pick it up. It is such a gorgeous watch. I'm glad you ended up getting that blouse from Ann Taylor - it will look great on you. Looking forward to hearing how that cuticle pen works, too! So many great items! Love love love that tote and those watches! 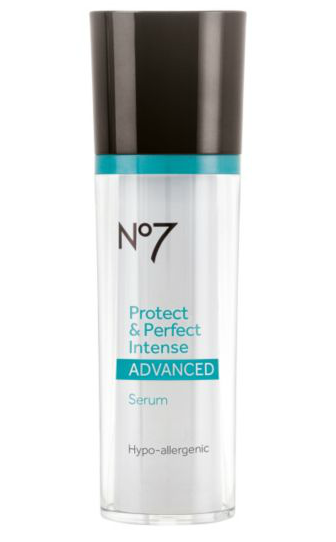 I've heard great things about that No 7 brand and I definitely want to get some! You'll have to let us know what you think if you try it!